Room wasn’t ready on time, place was kinda dingy. My room felt very cramped and non-professional. One of the ‘beds’ was just a mattress on the floor. One bathroom per floor and it was disgusting and the floor was always wet. Breakfast is okay as long as you wake up early to get some. Guests were loud and I was on the first floor, you can hear everything in the common room. It’s okay for a place to rest your head for the night but would not recommend a long stay. Good location though! This was not a pclean facility. Especially the upstairs bathroom. The upstairs shower floor was covered in hair and I had the wash the toilet seat before it could be used. The management has a very sweet German shepherd puppy that was too skinny. A terrible experience! Dont go there!!! Its difficult to make a resume, but the conditions in the hostel were awful (the bathroom, the breakfast and the room). We talked really kindly with the owner telling him that we wanted to leave, asking for some refound and he was really rude. He told us that we were men, supposed to no be complaining like girls do, then he told us that he didnt liked people from Chile, he was such a racist and male chauvinist rude person. 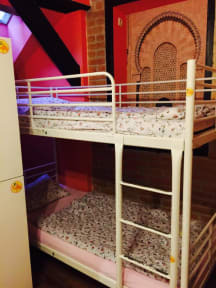 My worst experience in a hostel.